Gum recession is a dental health condition that should always be taken seriously. That’s because gum recession is often an early sign of periodontal disease. It’s a common problem for adults over the age of 40, but it can also develop in people’s teenage years. The good news is there are many ways you can improve gum recession. Regular appointments with the dentist are crucial for keeping your mouth healthy and avoiding any serious consequences from gum recession. 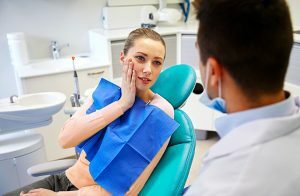 If you are seeking advice for dealing with gum recession or looking for a periodontist in Fairfield County, CT, Periodontics & Implant Dentistry Center, LLC is the best choice. We will discuss 4 common signs of gum recession below to help you recognize early warning signs of periodontal disease and keep your gums healthy. One of the initial signs of gum recession and periodontal disease is having tender gums. This is not necessarily a painful symptom, but it can lead to periodontitis if not properly treated. If you notice that you have bleeding, red, purple, or swollen gums, you might be dealing with early stages of periodontitis. If you have questions about gum recession in Fairfield County, CT, Periodontics & Implant Dentistry Center, LLC can certainly help out. Gum recession normally means that your teeth are suffering from damage thanks to plaque and tartar. Recession signifies that the health of your gums is slowly deteriorating. This can lead to increased sensitivity with your teeth. If you have noticed that your teeth are more sensitive than usual, it might be time to schedule a checkup with your dentist. Bacteria and periodontal disease under your gums around your teeth can cause the teeth to be loose and eventually lead to tooth loss if not properly treated. Gum disease is a serious condition that should be dealt with sooner rather than later if you value your teeth. As the disease gets worse, gum pockets deepen and the attachment structures around your teeth is lost. Another sign of periodontal disease and gum recession is having exposed roots. This symptom of gum recession is very uncomfortable and causes increased tooth sensitivity. You might just be brushing too hard, but exposed roots are also a symptom of periodontal disease. Keep that in mind if you notice exposed roots in your mouth.